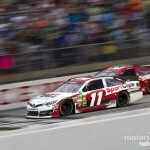 Returning to the #11 Toyota for his first full race since being sidelined earlier this season following a late-race accident at Auto Club Speedway, Denny Hamlin proved he was ready to get back to racing by securing the sixth starting position for the Southern 500 at Darlington (S.C.) Raceway. Denny battled a tight-handling Camry from the start of the 367-lap event and slid back to 11th by lap 46. Settling in for a long span of caution free racing, the #11 team made several green-flag pit stops over the first 300 laps of the race, making adjustments on each stop to improve the handling of the #11 car. The improved handling combined with fast pit stops by the #11 crew during some late race cautions allowed Hamlin to climb through the field during the closing 25 laps of the 500-mile race to finish second behind his Joe Gibbs Racing teammate Matt Kenseth.